The first finished, RVIA certified model from a company looking to create a new icon. Brian Buzarde uploaded Land Ark RV - Drake through Add A Home. "Psychology and emotional response play big roles when you're living in such a relatively small space, so subtle moves can have a large impact." Whether one is looking for a weekend retreat or a mobile home equipped for an extended sojourn, the two founders have spent years researching and testing so that this model can be the ideal solution for all. Aside from its stunning look, what makes the Drake unique is the thoughtful expertise that has gone into its design. Crafted by Land Ark RV's founders Brian and Joni Buzarde, who have been living the mobile tiny house lifestyle since 2011, this travel trailer has been years in the making. The master loft fits a king bed, and features an egress window and two awnings. This built-in custom couch offers ample storage underneath. With a sleek, contemporary profile, the Drake is equally comfortable in rugged terrain or a more refined setting. Here is a look at the ladder accessing the storage soffit. The bathroom window extends your sight-line through the space and outward. Large, stainless under-mounted sink makes real cooking and cleaning as easy as it is in a typical house. A closer look at the white-washed walls and sleek black hardware. 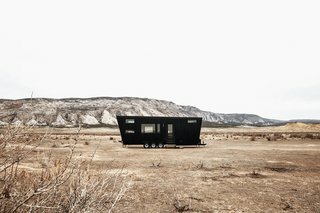 Large for a tiny house RV, but still small - especially in the western landscape. The flex room can fit a queen-size bed, or be outfitted as an office. Spacious enough to serve as a tiny home, yet small enough to still maintain a tiny footprint—especially within the context of the western landscape—the Drake is ready for adventure. The light and shadows on the corrugated metal create a visible texture and intricacy of scale that changes with the sun and viewing angle. Custom closets designed by Land Ark; refined, cut and assembled by Twig Custom Builders. The kitchen and living areas are integrated together inside the large main room, yet each can still function as its own autonomous zone. The tall ladder lives secured against the wall, but can be attached to either the guest loft or storage soffit, providing access to either. Ample natural light enters via the multiple windows. As you can see above, stylish cabin vibes flood the home. The loft ladder can be hung against the wall as shown or secured at an angle for ergonomic climbing. The master loft easily fits a king size bed. Ladder and built-ins designed by Land Ark, cut and assembled by Twig Custom Builders. The pine ledge wraps around creating useful storage. Integrated linen nooks can be seen in the lighted mirror's reflection. The bathroom features a one-piece toilet, 30x60 tub and Kohler wall surrounds. The bar-top is wrapped in gorgeous pine siding. The low sloped roof appears steeper from different angles, giving the house a sort of visual movement even while it's stationary.